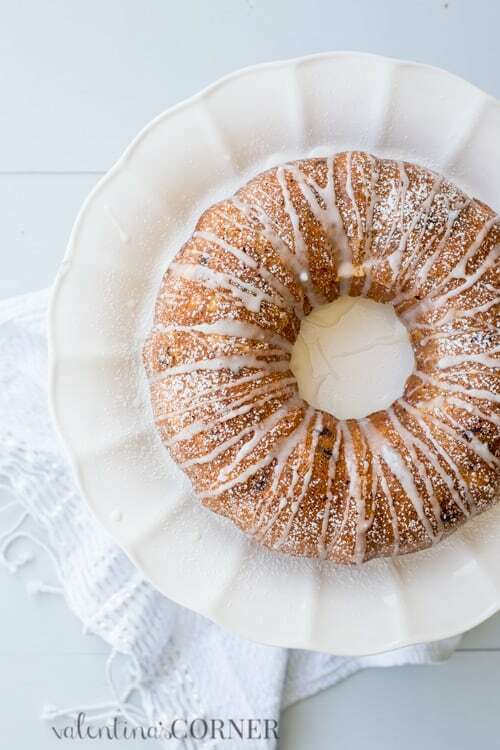 Banana Bread Bundt Cake with Cream Cheese is a great way to take a simple banana bread recipe and make it look so appetizing. The cream cheese layer gives the cake so much flavor. PIN this recipe to your Dessert Board HERE! One can never tire of banana bread recipes, especially in the fall when the temperatures cool and turning on the oven doesn’t seem so horrible! Banana bread is a great way to use up overripe bananas. It’s so easy and quick to whip up a loaf of bread. However, sometimes you don’t want a simple loaf of banana bread. You want something that’s just a little more appealing and have more flavor. Look no further – this is the recipe for you. 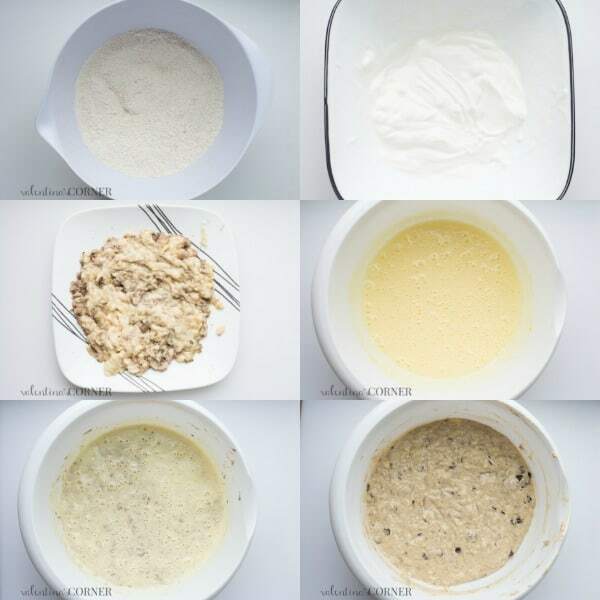 Prepare the recipe for the banana bread. Prepare the cream cheese layer. 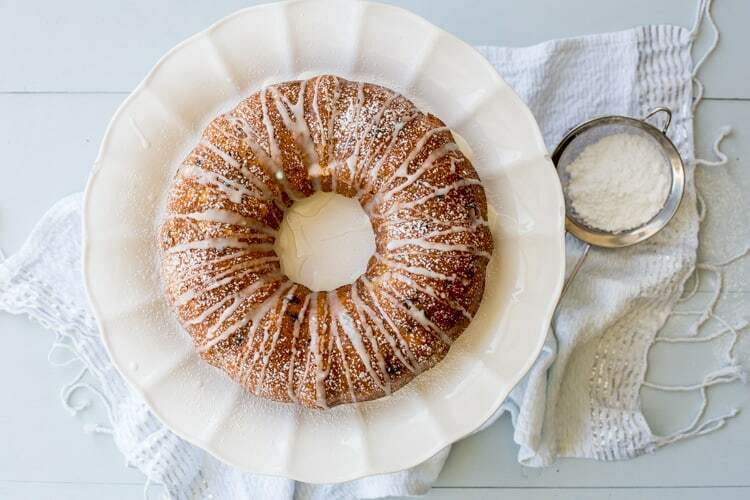 Pour the batter into a bundt cake, add the cream cheese layer and pour remaining batter. Don’t feel overwhelmed by the difficulty of the cake. It’s almost just as easy as it is to make a simple banana bread loaf. Once you try the cake, you will realize all the effort you put into it was worth it. TIP: When adding the cream cheese, don’t pour it all the way to the edges of the batter, the cake will not seal and will crack once baked. Try these other great banana recipes! Banana Nut Bread– A classic banana bread recipe with nuts. Raspberry Chocolate Chip Banana Bread– Banana bread with white chocolate and raspberries! Zucchini Banana Chocolate Chip Bread– Banana bread with a delicious twist! 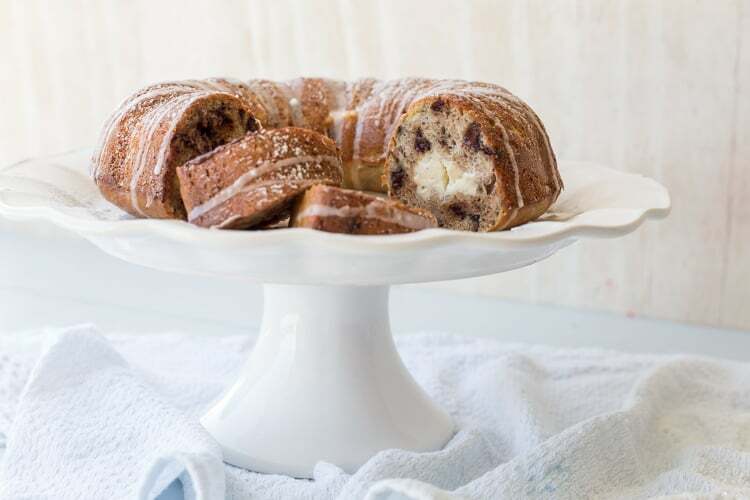 A delicious banana bread bundt cake with chocolate chip morsels and a sweet cream cheese layer. Lightly grease a bundt cake pan. Prepare cream cheese layer. Beat cream cheese, sugar and dash of vanilla until creamy. Set aside. In a small bowl combine sour cream and vinegar, set aside. In a bowl combine flour, cinnamon, baking soda, and baking powder, set aside. In a large bowl, on medium speed, beat sugar and eggs about 2 minutes. With a fork mash the bananas. Add bananas, sour cream, oil and vanilla to sugar/egg bowl. Give it a quick mix. Add half of the flour mixture and mix; add remaining flour and mix again. Stir in chocolate chip morsels. Pour 2/3 of the mixture into the bundt pan. Pour the cream cheese mixture into the middle, then gently spread. Don’t spread all the way to the edges of the pans or it will ooze out. Pour remaining banana bread mixture. Bake in a preheated oven at 350°F for 45-55 min. Check readiness with a toothpick will come out clean if ready. Remove bundt cake from oven. Run a cold wet rag on the bottom and sides of the pan. Let cake lightly cool. Take the platter you will be using, flip it over and put it on top the bundt pan, then, holding the cake and platter together flip the pan/platter. Once you set it down, let go of the pan and the cake will drop onto your platter. Once the cake is cooled, dust with powdered sugar, optional. Keep covered so it doesn't become dry.. I made this and it came out yummy??? That’s wonderful, Arthur. So glad you enjoyed the bundt cake. Thanks for visiting our online home, stop by and visit again. Valechka, I made this cake again! It is so delicious! We really love you at my house!? Thank you again for sharing your recipes with us! Oh My Tasty Goooooddddnnneeesss! Thank You! Hi is that an icing over cake as well and can I use white wine vinegar thank you!! Hi Lisa.. White vinegar is just fine. The icing on top is just powdered sugar/milk. It’s just for decor and really doesn’t add flavor☺☺.. Enjoy.. Thank you Tonya. You version sounds absolutely delicious. We love Nutella as well, will definitely give that a try.. Thanks for sharing . 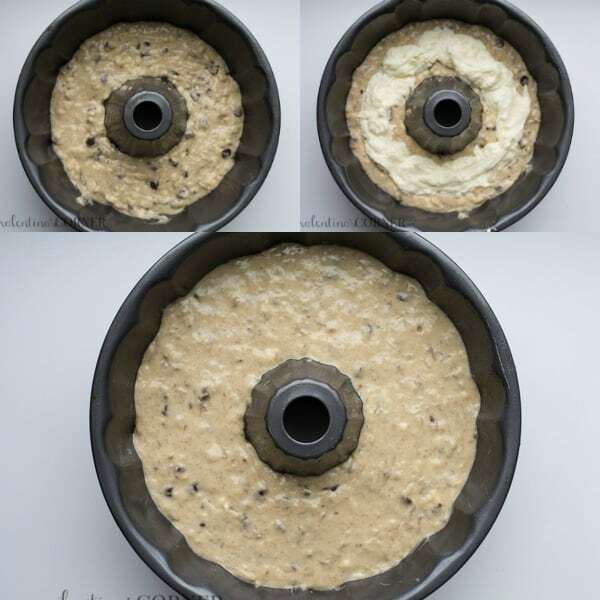 Sorry, Valechka, for confusion, I want to clearify: I first put 1/2 of the batter first, then cream cheese, then nutella, (swirled slightly with a long teaspoon handle into the batter and then added the rest of the batter. 🙂 I just remembered that I only had 3 bannanas, and it worked. Thank you again for your hard work and a very yummy recipe! Before I could snap a picture, my kids and I devoured it!!!!! Truly the best recipe for banana bread!! With chocolate!!! With cream cheese!!!! Ahhhhh. ……. Thank you for sharing ! God bless ! What oil did you use? Is vanilla extract or imitation fine? Hi Nila!! :) You can use any oil: canola, vegetable or even coconut oil. I used vanilla extract. I’ll add that to the recipe, thank you☺☺..